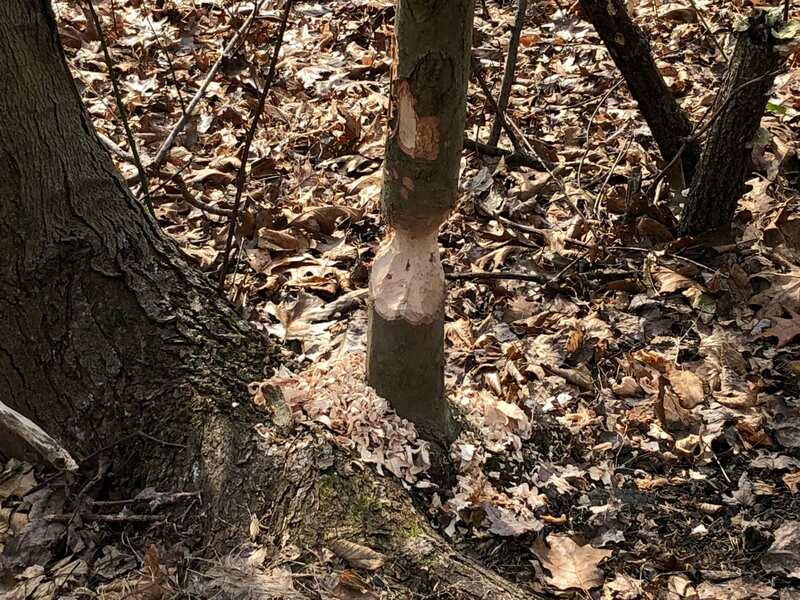 Signs of Winter 8: Beavers of Roaring Run! The Roaring Run Trail runs along the northern bank of the Kiskiminetas River just outside of the town of Apollo. A few weeks ago, Carl Meyerhuber and I were walking the trail and noticed abundant beaver sign along the stream bank starting about a quarter of mile from the parking area. 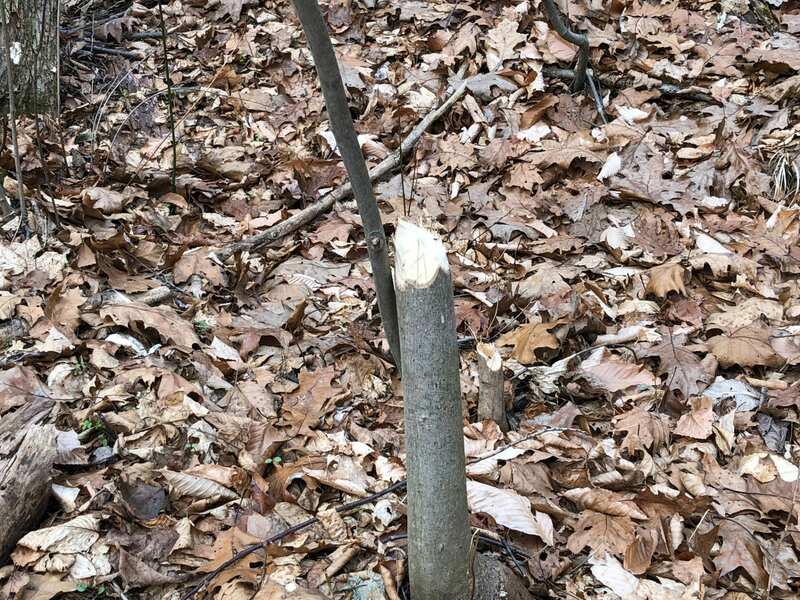 Numerous small trees (mostly red maples, yellow poplars and yellow birches) were cut down to pointed stumps a foot to a foot and half tall. Piles of fresh wood chips surrounded each stump, but the rest of tree and all of its canopy branches were gone. 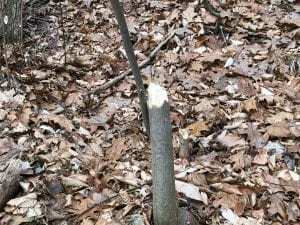 There was also fresh gnaw sign on the trunks of several large (a foot and half trunk diameter) black cherry trees and a number of medium sized maples and birches. I hadn’t see any of this tree damage through the fall even though I had been down on this trail almost daily either walking or riding my bike. Possibly, the seasonal die-back of the Japanese knotweed that thickly covers most of this bank has proceeded just enough to let us glimpse what is happening to the trees. We can now see, though, that the Roaring Run beavers are active! North American beavers ( Castor canadensis) are the second largest, living rodent in the world. 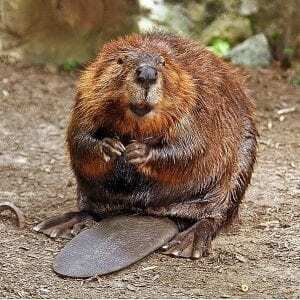 Adult beavers average between thirty-four and sixty-five pounds (although, according to the Pennsylvania Game Commission’s 2011 report on beaver management in the state, several beavers over seventy pounds have been trapped in Pennsylvania). They are considered to be obligatorily vegetarians although there are reports of them opportunistically scavenging dead fish and other carrion in their stream-side habitats. All spring and summer they eat a wide variety of water plants but survive through the winter by consuming the inner bark of large number of tree species (especially aspen, red maple (and other maples, too), willow, birch and alder). In the early winter months beavers forage out from their dens and take down as many small trees as they can. They may immediately consume the inner bark of some of these trees, or they may collect and cache the cut sticks, branches and slender, tree trunks in the rivers or ponds near their dens. They rely on these underwater caches for their winter food when conditions do not allow them to forage freely about. Beavers were once extremely abundant in Pennsylvania and all across North America. Uncontrolled trapping through the Eighteenth and Nineteenth Centuries, though, nearly drove them into extinction. There were once twenty-four or possibly twenty-five subspecies of North American beavers across the continent. Many of these subspecies have been lost in part due to their local extinction by trapping and also as a consequence of uncontrolled re-introduction programs that have led to the extensive inter-mixing of different genetic lines. It is estimated that prior to European colonization of North America there were 200 to 400 million beavers in a wide range of habitats from far northern Canada and Alaska down into Mexico. Today there are approximately ten to fifteen million beaver in North America. Beaver are nocturnal and can be observed coming into or out of their dens at dawn and at dusk. Their dens may take on a variety of conformations but are almost always associated with a protective stick-piled, mud-cemented palisade over an underwater opening. Classically, beavers build dams across small streams . These dams then back up stream water to generate a protective pond. The den is then built right into the superstructure of the dam itself. 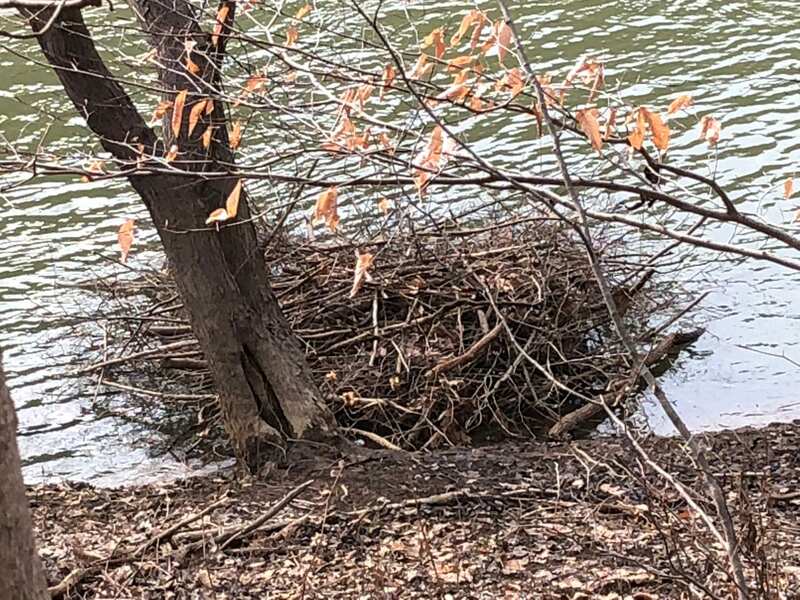 Beavers also, though, build dens on small islands in ponds and lakes (like the one at Harrison Hills Park that I wrote about in January 2016 (Signs of Winter 8)). They also build dens on larger rivers, like the Kiski. These rivers are too broad and too fast flowing to be dammed up so the beavers dig burrows into the stream bank (hence the common name “bank beaver” for these large-river dwelling beavers). They then shield the burrow entrance with a cemented pile of sticks. It is remarkable how this rodent is able to create such different functional constructions in such a wide range of different conditions! Beaver dams and ponds are extremely important components of their ecosystems. They help to control high water flow rates in the spring and store water to keep streams flowing in the summer. They greatly improve water quality by facilitating sedimentation and the control of pollutants (including bacteria from the feces of wild and domestic grazing animals and nitrogen and phosphates from agricultural field runoff). They generate vast areas of open water that support a wide variety of birds, mammals, insects and fish. Beaver dams and ponds have been shown in numerous studies to be extremely important factors in the overall abundance and success of wild trout and salmon throughout North America. They are also extremely important in stream rehabilitation programs. 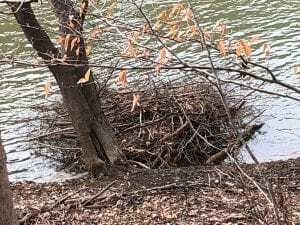 that are girdled and killed by beavers (the likely fate, for example, of those large black cherry trees that have gnawed on along the Kiski) become prime feeding and nesting habitats for woodpeckers. The holes the woodpeckers make in these trees can then be utilized by a myriad of cavity nesting bird species. The entire forest ecosystem becomes more dynamic and diverse because the presence and activity of the beavers! We’ll keep an eye on the tree growth in the beaver trimmed bank section of the Kiski! Hopefully, we’ll see more growing there than just knotweed! 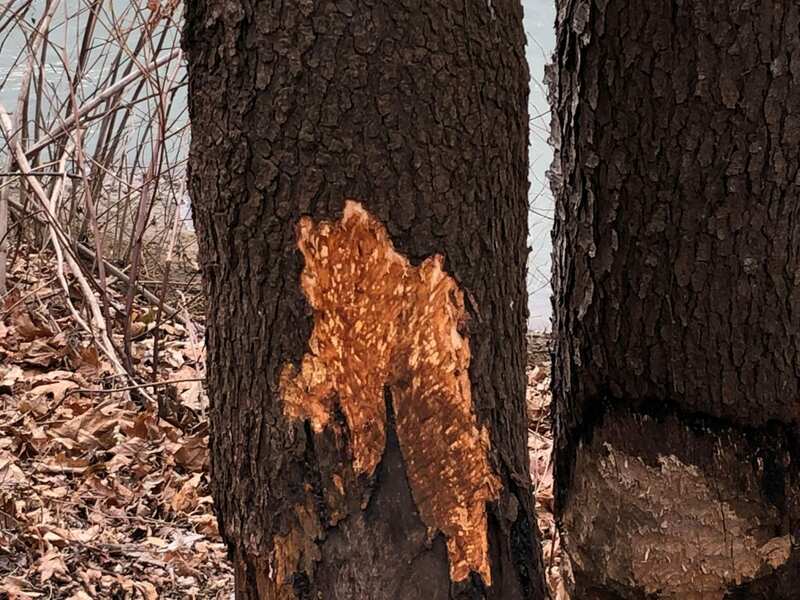 And, just to finish up this discussion about beavers: In an article in the Washington Post last summer (August 9, 2018) the impact of beavers introduced into the forests at the southern tip of South America was described. In 1946 a small number of North America beavers were released in the Argentinian side of Tierra del Fuego in order to “enrich” the local wildlife.” These beavers quickly established themselves and began to remake the Tierra del Fuego landscape. They also swam across the Strait of Magellan and invaded the shrub and grasslands of Patagonia. There are now 200,000 beavers in southern Argentina and Chile! Interestingly, these beavers are even damming rivers in places where there are no trees! They weave grasses and shrub branches together to make their dams and dens! The cost of removing these beavers from these ecosystems is being balanced against the on-going destruction of the habitat structure and species composition of the original ecosystems! 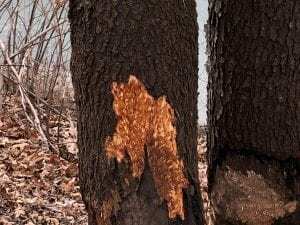 2 Responses to Signs of Winter 8: Beavers of Roaring Run! You are a model of what a person can do in retirement by utilizing your intellectual skills and powers of observation to stimulate your mind and bring joy into your life. So many people working today fear retirement because they are under the mistaken impression that their life will end in boredom. But not you! You are teaching a course on this attitude.